I know how it is, finding the time to get squeeze in some writing — it’s so tough! No, actually I don’t understand this. You have plenty of time to write. Plenty! Okay, hang on. You’re a little mad at me for not totally getting you right now, but stick with me. I’m going to explain. There are 168 hours in the week. I’d be willing to bet that a lot of us spend more time than we think mindlessly wasting a good portion of those hours. What time management comes down to is what you find important. If something is valuable to you, you’ll find time for it. So you have to make a decision — is writing a priority, or not? If it is, you’ll find time. I can hear protests already. But you don’t know how busy I am! Yes I do. I get it. We live in a chaotic universe that has us bouncing from place to place, activity to activity. We are busy. But trust me on this. If you’re really willing to examine your life and how you’re currently spending those 168 hours a week, you’re gonna find you could make some changes that will open up a new world of possibilities for you. Could you, say, sacrifice some time reloading your Facebook newsfeed to squeeze in 20 – 30 solid minutes of writing? I know I could. Could you get up 30 minutes earlier? The average adult needs less sleep than you think. Do the moments to yourself after the kids go to sleep usually involve watching a real housewife do something stupid? Maybe there’s some time there. What I’m getting at is that I’ve never met anyone who truly had no way, no how to schedule time to write or otherwise work on their chosen craft. It might involve some changes that will be uncomfortable at first, but if you’ve followed me for any length of time, you’ve heard me say it: pros do the work, even when they don’t want to. Amateurs find any reason not to. And there in lies the key. My guess is that finding time really isn’t the problem, it’s the excuse that keeps you from facing what’s really holding you back—fear. Still, I think we can all use some time management advice, so try Laura Vanderkamp’s book 168 Hours: You Have More Time Than You Think. With a few caveats, I recommend it. I don’t think you need to write every day. Sacrilege? Eh. Here’s the important thing— that you write. If trying to write everyday means you get so frustrated by the scheduling and logistics and that one day where you wrote just 43 words and they all sucked so hard you wanted to jump out the window, then backing off and choosing a schedule that suits you better is probably okay. Maybe instead you write every other day, maybe three times in one week, maybe just once a week. The important thing is that you decide when and where you’re going to write and you do it. Writing must become a habit. If for you that means every other day, then when the day to write comes up, there are no exceptions — you sit down and you write. Amateurs make excuses, pros do the work. But then, how little is too little? That’s a pretty personal choice. It depends on your goals, where you are in your writing career and your other commitments. If your hope is that some day writing will turn into a viable career (or say, generating material that supports your career as a director or actor), then you’re eventually going to need to hit something closer to a daily schedule. I write for three (sometimes four) hours a day four days a week. That’s the schedule that works for me. Pick one that works for you right now and stick to it. The one the works for you right now is that one the enables you to develop a consistent writing habit. And here’s a big secret: you can always change your schedule. My guess is that as the habit kicks in and those writing muscles start getting strong, you’re going to want to add more time. But if the schedule you start with isn’t working out, you can always adjust down. There’s no shame in that. It’s more about your attitude and your commitment. If those things fall in line, the schedule tends to work itself out all on its own. Scheduling time to write, really? You artist types out there might have an existential problem with schedules. It kills my art! I have to wait for inspiration to strike! Well, two points I want to make. First, the professional doesn’t (and usually can’t wait for inspiration to strike). He begins to work and expects inspiration to show up. It will. It does. But I get you, you artist. You need a little more freedom. That’s okay. You can have it. But you can’t back down on the commitment. Here’s the second point: Instead of approaching it from a I’m going to write every three days at 9 a.m. angle, your goal can still be time-based but a little more loose. Tell yourself at the end of the week you’re going to have 500 new words on your novel. Or maybe five new pages on your screenplay. Nothing about making sure you start right at 9 a.m. in there, is there? Just a goal, and some time to make it happen. The key to working like this is to make your goals SMART. Your goals have to be specific (target a particular project), measurable (defined end-points, i.e. 1,000 words), assignable (to yourself, obviously), realistic (that’s a BIG one), and time-bound (within 1 week or 1 month or whatever). Again, it’s really important to choose a realistic goal. This goes hand-in-hand with the idea of writing every day and then feeling bad because that’s not something you can currently do with your available resources (mostly, time and energy). Don’t go easy on yourself, but don’t set yourself up for failure by trying to finish and entire screenplay in thirty days when you’ve only ever written short films (and those each took you a couple months). You’re not racing anyone, and there’s no one to compare yourself to except yourself. One more thing on goals: smaller and shorter is better. So no goals of I’ll finish this novel in six months. That’s totally doable, but without milestones to celebrate along the way you risk losing focus and commitment. If you’re not going to work on a set schedule, take your projects in measurable chunks instead. All right, what are you waiting for? 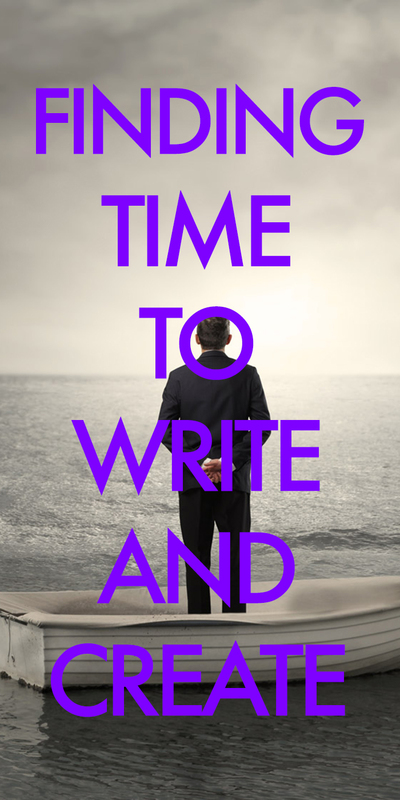 I bet you have a little bit of time right now to get some writing done. Go to it!